Eating too fast can cause tummy upset. Does Kitty have a sensitive tummy? Does he often toss his proverbial cookies after supper? Is his litter box filled with runny poop? These are all signs that Kitty's having an upset stomach. Relief is possible, but you'll have to determine the source of Kitty's upset. If Kitty has a food intolerance, he'll have trouble digesting his food. Unlike an allergy, which involves an immune system response, an intolerance means his body can't process something he eats. This could be a particular protein, like lamb or salmon, or a particular dye or flavoring present in his kibble. His vet will want to perform blood tests to rule out an allergy and will probably suggest an elimination diet. This involves feeding Kitty special meals free of dyes or harsh proteins, oftentimes containing home-cooked ingredients. Over time, you add different ingredients back into his diet to see how he copes and to determine the culprit. Once you know what's making him sick, you can eliminate it from his diet. Another possibility may just be that Kitty likes to eat a little too much. If he clears his bowl as soon as you fill it, he's likely scarfing it down too quickly. This can cause him to swallow some air and you'll find his dinner in a mess on the floor almost immediately. Try feeding him smaller meals throughout the day to avoid him eating too much at one sitting. Swap out his bowl for a wide, flat platter or cookie sheet. This will spread out the kibble and force him to slow his pace. Every now and then you have to switch the type of food Kitty eats. If done too quickly, this can cause Kitty's stomach to revolt. When changing brands, opt for a food with similar ingredients to his previous favorite. 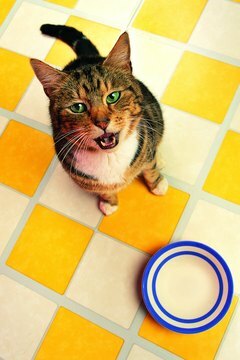 Avoid just giving Kitty a bowl of his new food and ditching the old. Make the change gradually, over the course of up to two weeks. Offer him small amounts of the new food mixed with the old and gradually increase the ratio of new to old food. Look for formulas with ingredients like chicken, turkey, oats, wheat and rice since they're easier for him to digest. Just as in humans, Kitty could be suffering from irritable bowel syndrome, or IBS. IBS refers to a collection of conditions that cause stomach upset. It is more common in cats over the age of 7 than in young kitties. According to The Cat Health Guide website, 50 percent of cases are caused by diet. Try putting him on a diet specially formulated for sensitive stomachs. Talk to your vet about supplementing his food with omega 3 fatty acid to alleviate symptoms. You've probably heard of probiotics for helping humans stay regular, and they can help your feline pal, too. Look for quality food or treats formulated with probiotics. 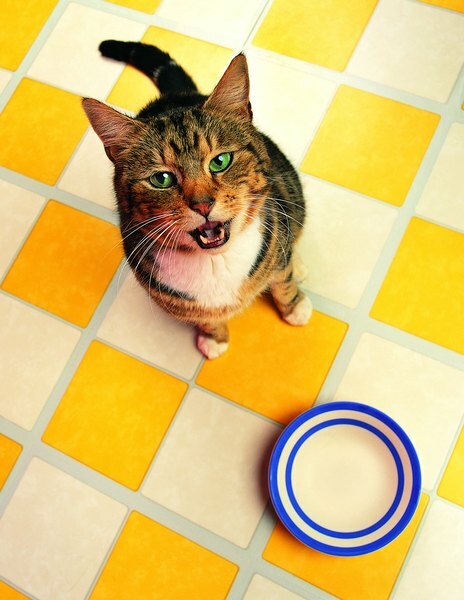 Hill's Pet Nutrition: Why is my Cat Throwing Up After Eating? What Are the Benefits of Laxatone for Cats? What Does It Mean if a Budgie Vent Is Dirty?